It’s not just that we’re hoping our Christmas/Hanukkah/Kwanzaa romance ebook will be published in time to catch the holiday sales. It’s not just that many of us have an artist’s budget and a shopping list that extends downstairs. Picture this: You’re at the family gathering trying to decide between Uncle Jerry’s stuffing (or latkes) and Grandma’s. Someone who is already into the spiked eggnog/Kedem/schnapps approaches you and says, “Well, if it isn’t Shakespeare. You written any best-sellers yet?” Then proceeds to criticize your career choice. Or even though everyone is nice, people talk to you as if you’re from Mars or you were adopted and no one bothered to tell you. If you have children, they’re pretending they were adopted. 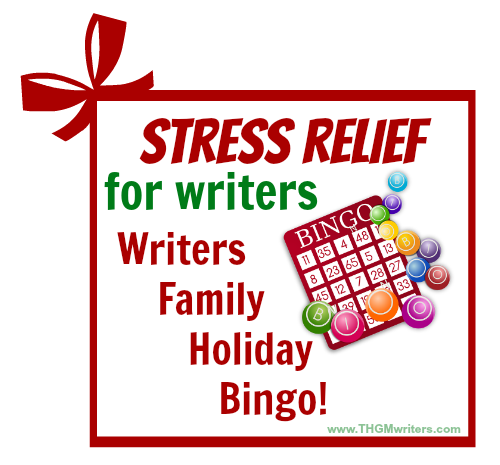 Take the typical stress people feel at family gatherings and crank it up to ten. Before long you’ve eaten the whole pan of stuffing/tray of latkes. Even if you come from “The royal Tenenbaums,” you still feel out of place. Especially if you live with your parents. Check off each square that applies to you, as discreetly as you can. Feel free to use wine, glitter, kids’ crayon, bits of mashed potato, or whatever will suffice to mark off the squares. For every square, add one minute to whatever writing time you can seize while surrounded by family. When you get five in a row, don’t call out “Bingo”. Or do, if you really don’t care what your family thinks. You’re The Writer–you’re supposed to be strange. 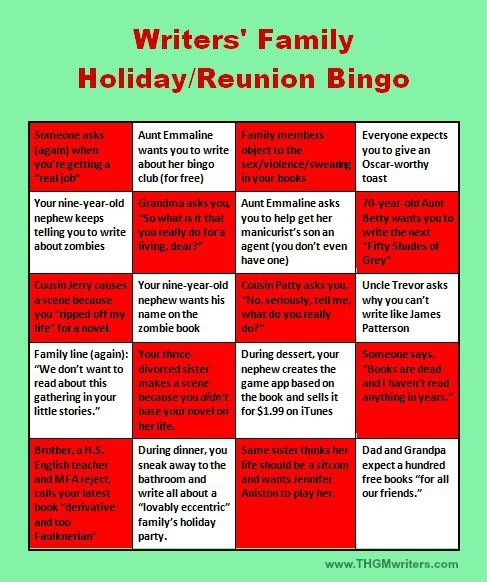 Make copies for all the family gatherings and pass extras out to your writer friends to remind them they’re not alone. The prize is surviving the family vacation/reunion/gathering while keeping your calm and perhaps even enjoying the festivities. After all, you are the dreamer–dream big. Note: No actual family members were named in the writing of this blog post.